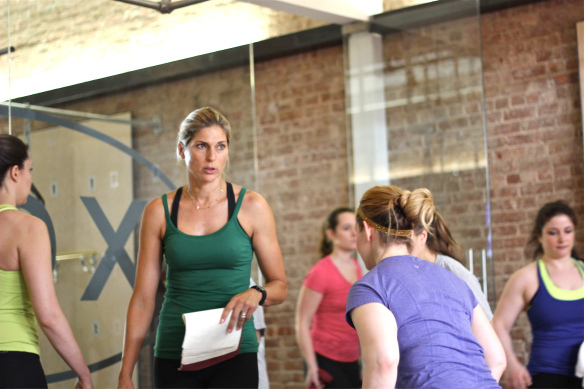 My very first reaction when I got the notice that one of my fitness icons, Gabby Reece, would be leading a workout at the always awesome Exceed, was that there was absolutely no way I could miss it. Held on the Sunday morning just before the Sports Bra Challenge, I knew it would be a lot to do on the same day, but really, how often is the chance to train with Gabby going to come along? After checking in at Exceed, I made my way to stash my stuff and caught my first glimpse of Gabby. She is a tall, striking presence and as I watched her explain the workout to the 2 Exceed trainers who were going to be assisting, I knew this was going to be even harder than I expected. Her program, BodyWise, is a 75 minute total body workout that combines cardio, resistance training and functional movement in a rigorous training circuit and is a workout that Gabby leads in a large warehouse space near her home in Hawaii. This event was capped at 30 people, but in Hawaii, it apparently can swell to 75 people! The group that had gathered on Sunday at Exceed was a fiercely fit crew and as she ran through a demo of every move we were going to be doing that morning, everyone seemed a little in awe of the fact that we were going to get to work out with her. There were 22 different moves for the 75 minute class and as I watched her go through each one in succession, I knew I was in trouble…not just because each one looked challenging but mostly because I was NEVER going to remember all 22! Gabby paired us off and we all made our way over to the first station. In my head, I thought we were doing the same exercise as the people we were following. So not the case! Less than a minute in, she came over and yelled at us –“WHY are you all doing the same exercise? ?” and all I could think was “Oh damn, I am already in trouble with Gabby!” After sorting out what exercise we were supposed to be doing, and understanding that we were moving to whatever station the people we were following behind just finished, we got down to business.